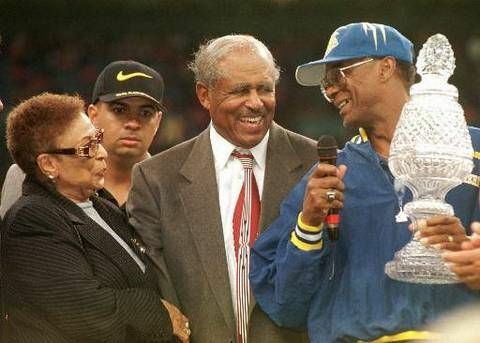 It is with great sadness that we inform you that Doris Robinson a well known member of Sigma Gamma Rho Sorority Inc., and the wife of legendary Eddie Robinson — one of the most respected football coaches in college football history — has passed at 96 years old. Doris grew up in Baton Rouge and knew her husband Eddie since elementary school. The two were together in college and moved to Grambling when Eddie took over its football program in 1941. Eddie and Doris became the patriarch and matriarch of Grambling athletics and Doris was highly visible and well known by all who went to the university. Eddie Robinson soon became one of the most respected football coaches in college football history with a record of 408 career game wins and Doris was always by his side. “Whether it was a game in Chicago, New York or Japan, Doris was always there,” The News Star reports. In their 66 years presiding over the campus, the Robinsons helped put Grambling on the national map, sending players to the NFL and helping others in the community succeed. Rep. Patrick O. Jefferson reffered to Doris as a “Louisiana treasure” while speaking at her funeral last week and other speakers used “The First Lady of football,” “the glue to the program” and a “national icon,” when describing her. Are you an SGRho or a Grambling State grad who has memories of Doris? Leave them in the comment section below. Click on the arrows below to see photos of Doris throughout the years.